This article is about the actor and son of Arnold Schwarzenegger. For the attorney and nephew of Arnold Schwarzenegger, see Patrick M. Knapp Schwarzenegger. 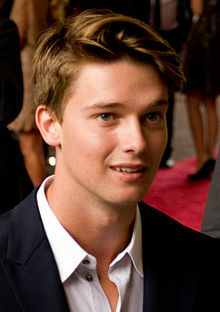 Patrick Arnold Shriver Schwarzenegger (born September 18, 1993) is an American actor and model. He is the son of Arnold Schwarzenegger and Maria Shriver. Through his mother, Schwarzenegger is related to the Kennedy family, and is a grand-nephew of John F. Kennedy, the 35th President of the United States, as well as the senators Robert F. Kennedy and Ted Kennedy. Schwarzenegger was born and raised in Los Angeles, California. He is the elder son of Maria Shriver, a journalist and author who is a member of the Kennedy family, and Arnold Schwarzenegger, an Austrian-born bodybuilder, actor, and former Republican Governor of California. Schwarzenegger has two older sisters, Katherine and Christina, a younger brother, Christopher, and a younger paternal half-brother, Joseph. His maternal grandparents were activist Eunice Kennedy Shriver and diplomat and politician Sargent Shriver. Schwarzenegger was in a 6-month-relationship with Miley Cyrus from 2014 to 2015. As of 2016, Schwarzenegger is in a relationship with Alabama model Abby Champion. While studying at Brentwood High School, he took private acting lessons with Nancy Banks. In 2012, he matriculated at the University of Southern California, and graduated from the USC Marshall School of Business with a minor in Cinematic Arts in May 2016. Patrick Schwarzenegger was part of the Lambda Chi Alpha fraternity. At the age of ten, Schwarzenegger had a small role in the movie The Benchwarmers. Throughout his childhood, he practiced acting with his father. At age 15 he started a clothing line. In 2014, Schwarzenegger franchised his own Blaze Pizza at The Grove in Los Angeles. He has since opened up other locations at USC where he attended school and Staples Center. Patrick is also signed with LA Models, which had plans to push him for Ralph Lauren and Armani ad campaigns. He has stated that he hopes to raise awareness of his clothing company by taking on high-profile modeling jobs. Schwarzenegger had supporting roles in 2012's Stuck in Love, 2013's Grown Ups 2 and 2015's Scouts Guide to the Zombie Apocalypse. His first leading role was opposite Bella Thorne in 2018's Midnight Sun, a romantic drama about a teenage girl with a rare medical condition. 2015 Scream Queens Thad Radwell Episode: "Thanksgiving"
^ "Governor Arnold Schwarzenegger's Brentwood High School Commencement Speech". gov.ca.gov. June 7, 2008. Archived from the original on June 18, 2008. Retrieved June 22, 2008. ^ Brozan, Nadine (September 30, 1997). "Chronicle". New York Times. Retrieved April 18, 2008. ^ "State of California Certificate of Live Birth" (PDF). TMZ. May 20, 2011. Retrieved August 26, 2017. ^ "Schwarzenegger's son with housekeeper born days after Shriver gave birth". Chicago Tribune. Archived from the original on May 21, 2011. ^ Johnson, Zach (May 2, 2012). "Patrick Schwarzenegger:I'm going to the University of Southern California". USmagazine.com. Retrieved June 29, 2014. ^ a b "Meet Patrick Schwarzenegger, Arnold and Maria's enterprising son - latimes.com". Latimesblogs.latimes.com. 2011-04-20. Retrieved 2011-12-05. ^ Lowe, Laurence. "Patrick Schwarzenegger: Critical Eye". Details. Retrieved 2011-12-05. ^ Fleming, Mike Jr. (October 13, 2016). "Open Road Acquires 'Midnight Sun', Sets Wide Summer Release For Bella Thorne & Patrick Schwarzenegger Pic". Deadline. Wikimedia Commons has media related to Patrick Schwarzenegger.